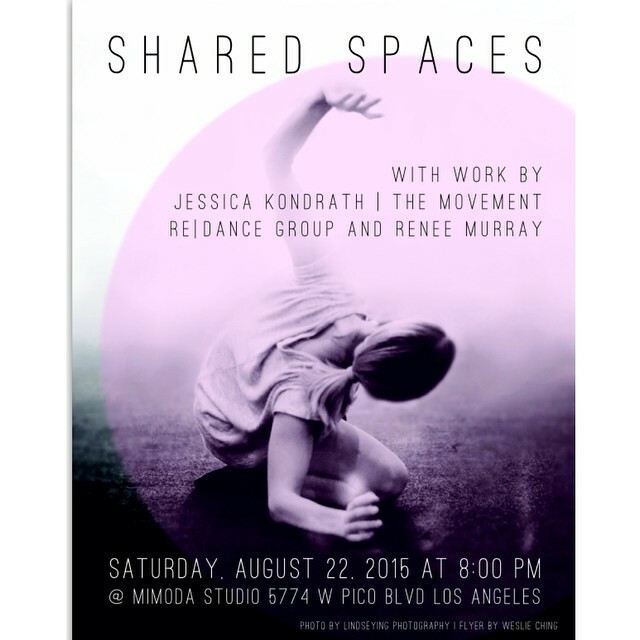 This Saturday Jessica Kondrath | The Movement presented an evening of dance at MiMoDa Studio. Shared Spaces was an apt name for the performance as it featured Kondrath’s Company along side guests RE|Dance Group and Reneé Murray. The studio setting provided an intimate evening of dance with an audience on two sides of the performance space. The seating arrangement allowed a range of perspectives on the movement that was further accentuated and highlighted by the expressive lighting design of Allen Clark. The evening began with guests Lucy Riner and Michael Estanich of Chicago’s RE|Dance Group. Abbot & Viv, a duet set to excerpts of Bach’s Cello Suite, featured Riner and Estanich as a struggling couple that seemed destined for conflict despite a desperate yearning to be together. The modern dance vocabulary combined repetitive gesture with full body movement that had the dancers on and off the floor, falling and catching each other through the space. The use of a long bench, two chairs and a large glass bowl added to the pedestrian environment of the piece. The glass bowl seemed to represent the fragility of their relationship as they balanced it precariously on their heads as they walked, and on their backs as they crawled. The presence of the bowl echoed a theme of water and washing as reflected in face washing gestures and the choice of blue for the costumes (Riner in a blue dress and Estanich in a blue shirt and slacks). Perhaps the bowl and water references represented an ablution of purification, renewal, and new beginnings for this couple that never seemed to relax into connection. Unfortunately, the strife proved too much for this couple to overcome as they ended apart with no promise of reconciliation. The following work was a solo excerpt from Kondrath’s evening length work Fleeting. Entitled You Can Be Anything, Forgotten or Lost, this solo (performed by Taylor Worden) was the highlight of the evening. Worden commanded the space with a sense of grace and ease that balanced the athletic with the subtle. Kondrath’s aesthetic sense of patience as a choreographer allowed the audience to soak in the design of the work before propelling us forward in explosive moments of virtuosity. The theme of loss was evident in the qualities of the movement, which evoked a sense of something slipping from the dancers grasp, perhaps a memory, a dream, or a person. Although this piece is an excerpt of a larger work, there was a sense of wholeness to this performance, driven both by the ebb and flow of the choreography, and Worden’s generous performance that was articulate and expressive. Following a brief intermission, the second duet of the evening was choreographed by Reneé Murray with Jessica Kondrath. While With Jeanette & Barbara was another duet performed by its creators, the nature of the duet varied greatly from the narrative work of Riner and Entanich. Murray and Kondrath were in some ways an unlikely pair. Murray possessed a soft quality in her movement that was understated and unassuming, while Kondrath moved with an energized quality that pierced the space. It seemed that Murray skirted the perimeter of the performance space often regarding or addressing Kondrath without a return response. This generated an inequity between the performers that I could not quite resolve. At certain times it seemed they were in different worlds, experiencing the movement through a different lens, and yet when they did come together for brief interludes of connection and shared weight these worlds intermingled unexpectedly. With Jeanette & Barbara had a very personal tone, in which the solo material for the dancers resonated clearly for each, but left me questioning their presence side by side. A cast of three females took the space for Kondrath’s work entitled I Still Haven’t Learned How to Dream Wide Awake, set to music by Brian Wood. I have seen this work before with the live musicians, and I do feel it is stronger with the musicians present. The piece embodies many of Kondrath’s trademarks, including long extensions, arches of the spine and long low shapes. However, without the musicians present this work took on a more ominous nature. The dissonance in the music seems more pronounced, making the hyperextension of the dancers limbs take on a more tortured feel and the ephemeral gestures take on a sense of uncertainty and disorientation. The middle section of the work became driving and propulsive. Allen Clark’s lighting design featured a palette of warm tones, transforming the dancers into earthy and animalistic figures that contrasted the ethereal qualities I often see in Kondrath’s work. Lucy Riner returned to the stage for her solo What Brings Me to This Place set to the techno beat of DJ High Maintenance. Riner began kneeling on the floor writing in the sand before erasing the invisible words with a sweep of the arm or leg. Her voice had been edited into a soundtrack of overlapping self-definitions “I am a mother. I am a choreographer. I am a daughter. I am a wife. I am a teacher. I am a friend. . .” The words overlapped into a frenzy that ended with the message that shaped the rest of the solo, “I am in constant motion.” And, for the duration of the music, Riner was in constant motion, dropping, swinging, springing, running and falling through the space at a relentless pace. The autobiographical tone of the work was evident. We were watching her life, a seemingly endless string of movements without respite. And, she did it! It was a marathon but she made it through. While the athleticism of the work is truly commendable, the choice in music did not support the overall theme of the work. The music had a tone of joy and release, which was not reflected in Riner’s choreography or emotional expression. The show closed with a premier of Kondrath’s new work The Wit of Small Things. A contemporary ballet for six females, this piece had a very hip quality that resonated with the music by The Books. Dressed in short white shorts and structured sleeveless tops, the dancers were all limbs as they performed the extension driven movement vocabulary. The aesthetic beauty of the dancers with their elegant lines and hair in a French twist added to the overall design of the work, so much so that I find it hard to speak about one without the other. The slippery quality of Kondrath’s movement turns the memory of the movement into a collage of legs and arms reaching into space without a specific image to grasp onto. The flowing design of the dancers bodies in space creates a visual experience that is both engaging and elusive. While the movement vocabulary left me a sense of satisfaction, the arc of the work on the other hand left me feeling incomplete. The piece contained few duets that did not connect as strongly to the aesthetic whole of the piece, and with the piece ending shortly thereafter, I did find myself wanting additional resolution for the work. But, I am uncertain about my own reaction here and would like to see the piece again to affirm my initial response. Perhaps therein lies the success of the work, as I am left wanting to see the work again, to shake myself form the hypnosis of the movement to more firmly grasp the design of the whole. Saturday’s show was a treat as I was able to experience another performance space at MiMoDa, while enjoying a variety of dance works that balanced narrative with abstraction, and the pedestrian with the Classical. While having the audience on two sides of the space offered an interesting “in the round” feel to the show, I did notice that I was in fact sitting on the side of the performance space and wondered if my impression would have been different had I been sitting at the intended front. MiMoDa is a unique space and with its attached café, it is a great spot for keeping the dance culture connected as many audience members stayed after the show for a coffee and chat. I left this event feeling particularly energized by the independent LA dance community and eager to see more shows at this venue and presented by Jessica Kondrath | The Movement.